Brilliant location, on the beach. Wonderful clean beach and sea. Excellent staff and super restaurant. The perfect holiday for a family and only 20 mins to the airport. They are all so welcoming and friendly. Maria is great and always willing to help. We even got a gift from. We where upgraded to the biggest room with the sea view which was marvelous. Her mom and dad are such wonderful people. I loved my stay here. I will recommend this hotel to everyone especially a family vacation with kids. And the food is HEAVEN. It's delicious. Big apartment right on the beach. We got room with sea view. Has safe. Big parking next to acommodation, good taverna. It was cleaned every 2 days. Out stay was great. The room and property was very clean. Maria was so nice, she upgraded my wife and I's room for our honeymoon as it was nearing the end of the season. Our room was spacious and had a great view! Maria also was very helpful with emailing before our arrival on directions and what time we were to arrive. Our stay was so relaxing on the beach and the staff was extremely nice and friendly! Definitely take advantage of the restaurant the food is great and price is good. We will definitely recommend and be back! Everything was perfect. 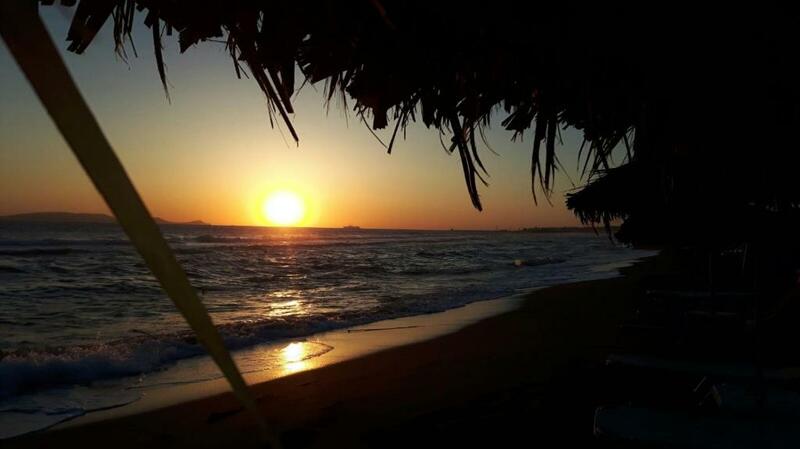 The property is by the beach and the umbrellas/long chairs are available free of charge for guests. There is a small playground for kids as well. The rooms are nicely decorated and we were very satisfied with the kitchenette. Many restaurants, cafes, and markets are within walking distance. Our host Maria and her parents were wonderful and very friendly. Very clean, large room. Excellent friendly staff. Very nice breakfast. The lovely family that owns it made me feel right at home. The warm welcome from all the Troulis family and the restaurant/bar staff; the option of an extensive buffet breakfast; the proximity of an excellent beach. the apartment was also close to excellent transport facilities for going into the centre of Heraklion. The room was clean, the bed was comfy and the shower was hot. Lock in a great price for Troulis Apartments – rated 9 by recent guests! The seafront Troulis Apartments is located in the coastal Amoudara Village, facing Agapi Beach. It features free sunbeds and umbrellas on the beach and free Wi-Fi access throughout. Air-conditioned accommodations offers a balcony. Troulis Apartments is 4.3 mi from Heraklion City, the main port and the coastal village of Palaiokastro, where guests can visit the Venetian Castle. It is 7.5 mi from Heraklion International Airport. Water sports activities are provided on the beach. A bus stop is only 150 feet away. When would you like to stay at Troulis Apartments? Air-conditioned room offers a satellite TV and opens out onto a balcony. Air-conditioned studio offering a kitchenette with an electric kettle, fridge and cooking hobs for the preparation of light meals. A satellite TV and balcony are also included. Air-conditioned apartment offering a kitchenette with an electric kettle, fridge and cooking hobs for the preparation of light meals. A satellite TV and balcony are also included. Opening to a balcony with sea views, this air-conditioned studio has a satellite TV. It features a kitchenette with hobs and mini fridge. Free WiFi is provided. Please note that this room type has no kitchenette. This studio features a balcony, air conditioning and satellite TV. ΕΙΜΑΣΤΕ ΜΙΑ ΟΙΚΟΓΕΝΕΙΑΚΗ ΕΠΙΧΕΙΡΗΣΗ ΠΟΥ ΛΕΙΤΟΥΡΓΕΙ ΕΔΩ ΚΑΙ 20 ΧΡΟΝΙΑ ΠΕΡΙΠΟΥ. ΔΗΜΙΟΥΡΓΗΘΗΚΕ ΑΠΟ ΤΟΥΣ ΓΟΝΕΙΣ ΜΟΥ ΠΟΥ ΔΟΥΛΕΨΑΝ 17 ΧΡΟΝΙΑ ΣΤΗΝ ΓΕΡΜΑΝΙΑ ΚΑΙ ΕΠΕΝΔΥΣΑΝ ΤΑ ΛΕΦΤΑ ΤΟΥΣ ΣΑΥΤΟ ΤΟ ΟΜΟΡΦΟ ΜΕΡΟΣ .ΜΑΣ ΑΡΕΣΕΙ ΝΑ ΠΡΟΣΦΕΡΟΥΜΕ ΤΗΝ ΦΙΛΟΞΕΝΙΑ ΜΑΣ ΚΑΙ ΝΑ ΒΛΕΠΟΥΜΕ ΧΑΡΟΥΜΕΝΟΥΣ ΚΑΙ ΕΥΧΑΡΙΣΤΗΜΕΝΟΥΣ ΕΠΙΣΚΕΠΤΕΣ. ΤΟ 50 % ΤΩΝ ΠΕΛΑΤΩΝ ΜΑΣ ΕΙΝΑΙ ΕΠΑΝΑΜΒΑΝΟΜΕΝΟΙ.ΕΧΟΥΜΕ ΠΕΛΑΤΕΣ ΠΟΥ ΕΡΧΟΝΤΑΙ ΕΠΙ 20 ΧΡΟΝΙΑ ΣΕ ΜΑΣ !ΚΛΕΙΝΟΥΝ ΓΙΑ ΤΗΝ ΕΠΟΜΕΝΗ ΧΡΟΝΙΑ ΚΑΙ ΦΕΡΝΟΥΝ ΚΑΙ ΤΟΥΣ ΣΥΓΓΕΝΕΙΣ Η ΤΟΥΣ ΦΙΛΟΥΣ ΤΟΥΣ ΜΑΖΙ! ΕΡΧΟΝΤΑΙ ΓΙΑΤΙ ΝΙΩΘΟΥΝ ΣΑΝ ΣΤΟ ΣΠΙΤΙ ΤΟΥΣ ΘΑΛΠΩΡΗ ΚΑΙ ΑΣΦΑΛΕΙΑ ! ΑΠΟΛΑΜΒΑΝΟΥΝ ΤΟ ΠΡΩΙΝΟ ΤΟΥΣ ΔΙΠΛΑ ΣΤΗΝ ΘΑΛΑΣΣΑ ΚΑΙ ΧΑΙΡΟΝΤΑΙ ΚΑΘΕ ΣΤΙΓΜΗ ΤΟΥΣ ! ΠΑΡΕΧΟΥΜΕ ΚΟΥΝΙΕΣ ΓΑΙ ΤΑ ΠΑΙΔΙΑ, ΘΑΛΑΣΣΙΑ ΣΠΟΡ ΓΙΑ ΤΟΥΣ ΝΕΩΤΕΡΟΥΣ,, ΑΡΙΣΤΗ ΚΟΥΖΙΝΑ ΟΛΗ ΤΗΝ ΜΕΡΑ ΜΕΧΡΙ ΑΡΓΑ ΤΟ ΒΡΑΔΥ.Η ΠΟΛΗ ΒΡΙΣΚΕΤΑΙ ΜΟΛΙΣ 15 ΛΕΠΤΑ ΜΑΚΡΥΑ.ΥΠΑΡΧΕΙ ΣΥΓΚΟΙΝΩΝΙΑ ΚΑΘΕ 20 ΛΕΠΤΑ ΓΙΑ ΤΟ ΚΕΝΤΡΟ. ΥΠΑΡΧΕΙ ΛΕΩΦΟΡΕΙΟ ΚΑΤΕΥΘΕΙΑΝ ΓΙΑ ΑΕΡΟΔΡΟΜΕΙΟ! ΜΑΓΑΖΙΑ ΜΠΑΡ ΣΟΥΠΕΡ ΜΑΡΚΕΤ ΣΕ ΟΛΗ ΤΗΝ ΠΕΡΙΟΧΗ ΜΑΣ ΕΔΩ.ΠΑΡΟΛΑ ΑΥΤΑ ΕΙΝΑΙ ΠΟΛΥ ΗΣΥΧΑ ΓΙΑΤΙ ΔΕΝ ΗΜΑΣΤΕ ΣΤΟ ΚΕΝΤΡΙΚΟ ΔΡΟΜΟ. ΥΠΑΡΧΕΙ ΜΕΓΑΛΟ ΠΑΡΚΙΝΚ ΠΙΣΩ ΑΠΟ ΤΟ ΞΕΝΟΔΟΧΕΙΟ. ΟΙ ΚΑΡΕΚΛΕΣ ΤΗΣ ΠΑΡΑΛΙΑΣ ΚΑΙ ΟΙ ΟΜΠΡΕΛΕΣ ΕΙΝΑΙ ΔΩΡΕΑΝ.Η ΠΑΡΑΛΙΑ ΜΑΣ ΕΙΝΑΙ ΑΠΟ ΤΙΣ ΜΕΓΑΛΗΤΕΡΕΣ ΤΗΣ ΚΡΗΤΗΣ.ΕΙΝΑΙ ΥΠΕΡΟΧΗ ΓΙΑ ΠΕΡΙΠΑΤΟ. ΕΧΩ ΓΕΝΝΗΘΕΙ ΚΑΙ ΣΠΟΥΔΑΣΕΙ ΣΤΗ ΓΕΡΜΑΝΙΑ. ΕΙΜΑΙ ΠΑΝΤΡΕΜΕΝΗ ΜΕ ΔΥΟ ΠΑΙΔΙΑ ΠΟΥ ΣΠΟΥΔΑΖΟΥΝ.ΕΙΜΑΙ ΚΑΘΗΓΗΤΡΙΑ ΓΕΡΜΑΝΙΚΩΝ ΚΑΙ ΕΡΓΑΖΟΜΑΙ ΣΑΥΤΗΝ ΤΗΝ ΟΙΚΟΓΕΝΕΙΑΚΗ ΕΠΙΧΕΙΡΗΣΗ ΤΑ ΤΕΛΕΥΤΑΙΑ 15 ΧΡΟΝΙΑ. ΜΑΡΕΣΕΙ ΝΑ ΓΝΩΡΙΖΩ ΑΝΘΡΩΠΟΥΣ ΑΠΟ ΟΛΟ ΤΟΝ ΚΟΣΜΟ. ΠΡΟΣΠΑΘΩ ΝΑ ΙΚΑΝΟΠΟΙΗΣΩ ΟΣΟ ΓΙΝΕΤΑΙ ΚΑΛΥΤΕΡΑ ΤΙΣ ΕΠΙΘΥΜΙΕΣ ΤΩΝ ΠΕΛΑΤΩΝ ΜΑΣ ! ΤΟΥΣ ΘΕΩΡΩ ΦΙΛΟΥΣ ΜΑΣ ΚΑΙ ΟΙΚΟΓΕΝΕΙΑ ΜΑΣ! ΕΧΕΙ ΑΠ ΟΛΑ ΥΠΑΡΧΟΥΝ ΕΚΕΙ ! ΜΑΓΑΖΙΑ ΤΟΥΡΙΣΤΙΚΑ, ΜΠΟΥΤΙΚ , ΣΟΥΠΕΡ ΜΑΡΚΕΤ, ΚΑΦΕΤΕΡΙΕΣ, ΜΠΑΡ, ΚΙΝΗΜΑΤΟΓΡΑΦΟ,Φ,ΑΡΜΑΚΕΙΑ ΕΣΤΙΑΤΟΡΙΑ.ΚΤΛ ΕΠΙΣΗΣ Σ ΕΜΑΣ ΣΤΗΝ ΠΑΡΑΛΙΑ ΥΠΑΡΧΟΥΝ ΟΡΓΑΝΟΜΕΝΑ ΘΑΛΑΣΣΙΑ ΣΠΟΡ! Η ΘΑΛΑΣΣΑ ΕΙΝΑΙ ΜΕ ΑΜΜΟ ΚΑΤΑΛΛΗΛΗ ΓΙΑ ΠΑΙΔΙΑ ! ΠΑΡΕΧΟΥΜΕ ΟΜΠΡΕΛΕΣ ΚΑΙ ΚΑΡΕΚΛΕΣ ΣΤΟΥΣ ΠΕΛΑΤΕΣ ΜΑΣ ΔΩΡΕΑΝ! ΕΙΝΑΙ ΥΠΕΡΟΧΑ ΝΑ ΚΑΝΕΙ ΚΑΝΕΙΣ ΠΕΡΙΠΑΤΟ ΣΕ ΜΙΑ ΠΑΡΑΛΙΑ ΤΟΣΟ ΜΕΓΑΛΗ Ή ΝΑ ΚΑΝΕΙ ΒΟΛΤΑ ΤΟ ΒΡΑΔΥ ΣΤΑ ΜΑΓΑΖΙΑ ΣΤΟ ΚΕΝΤΡΙΚΟ ΔΡΟΜΟ ! House Rules Troulis Apartments takes special requests – add in the next step! Troulis Apartments accepts these cards and reserves the right to temporarily hold an amount prior to arrival. Please note that children up to 10 years old enjoy discounted breakfast prices. Please note that Lunch and Dinner include prearranged menus. Kindly note that the dinner includes a starter, a salad, the main course and dessert (from a fixed menu). Drinks are at extra charge. 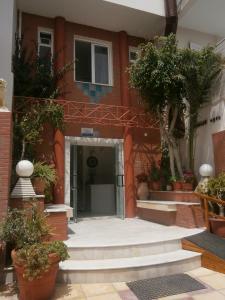 Comfortable rooms, very friendly and helpful host Maria, great location for trips to Heraklion and Knossos. Bust stop, souvenir shops and mini markets in close proximity. Free sun beds. Wonderful taverna on site! The rooms, stairs and the overall hotel were super clean. We were lucky to have a sea view room which made our stay even lovelier. 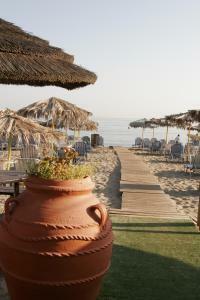 The food in the restaurant y the beach was very good and being able to use for free the sun lounges was a bonus. Got there at night and they left the wrong key with my name, went back and found the right key eventually. Had two beds and only one sheet. Then in the morning the owner told us it’s because she assumed we were a couple so it was my fault. I have never had to tell a hotel who I am traveling with to make sure beds are made up right. I am traveling with my mom by the way. When I went to the office in the morning to get another sheet, Maria tried to give us a gift in exchange for a ten star review. I gave back the olive oil when I checked out as my reviews cannot be bought. Room was filled with ants and when they were notified because all I wanted was some ant killer I was told I must have eaten in the room. Which I didn’t but it comes with a kitchenette so I assume people do sometimes so I guess if you want to use the kitchen you have to deal with the ants. Then Maria begged me not to write a bad review instead of helping me fix the ant problem. She send her mom over who was really sweet but she spoke no English and I speak no Greek so we did the best we could together. The view out of the room was of a fence, not a beach like the photos, parking is not onsite but beach parking, park at your own risk, the tv is the size of a shoe. Bathroom locks people in, no way to wash dishes soap,dish towels or drying rack. I travel 3/4 of the year for work and have never stayed in a place with so many problems and no help to fix any of them. Not worth the money. Location was great and the beach was nice! Poor wi-fi, terrible kitchen and utensils (no utensil at all) basically they don't want you to cook there.no dish soap and sponge to wash.tavern of the hotel which is right next to the beach we had the worst french fries ever.after that we didn't even try the rest of the menu.some weard guys staring at you by the beach which is very annoying and see is always vavey and endless wind all day long.why you are in heraklion if you want to enjoy swimming. Lovely reception with the always smiling face.very reasonable price to stay even in the high season.they give you a bottle of olive oil as gift when you check in. Hard matras on the bed, but after visiting hotels for 10 years in Crete i think thats normal Greek style. Appartment building is right at the beach, the provided sunbeds were perfect. Appartment is small but very clean, has everything you need incl watercooker, also a good size bathroom and balcony. No noise at night! If you want to experience a bit of nightlife its just a very short walk. 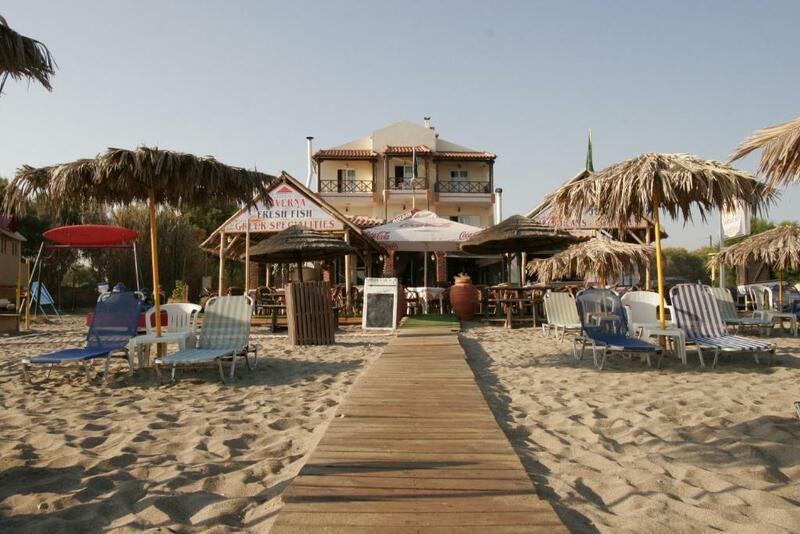 Amoudara is not a big nightlife place but Heraklion is very closeby. The restaurant downstairs provides a nice breakfast buffet, also great lunches and dinners. Kitchen open very late, even midnight! Prices very good and friendly staff. Also good service at the beach. There is a reef nearby in the sea, stones and some sea hedgehogs. Before the reef it's about shoulder depth. 1. Maria the host is great. When you come, there is hand-written plate with your name, room number and greetings. Maria knows all the guests and every morning greets them. 2. Location: a) 50 minutes and E1.7 by bus, 25 minutes and E25 by taxi - from the airport. b) Appartments stay on the beach. c) cafes and shops are nearby, including 2 hyper markets Sklabenites and Lidl. 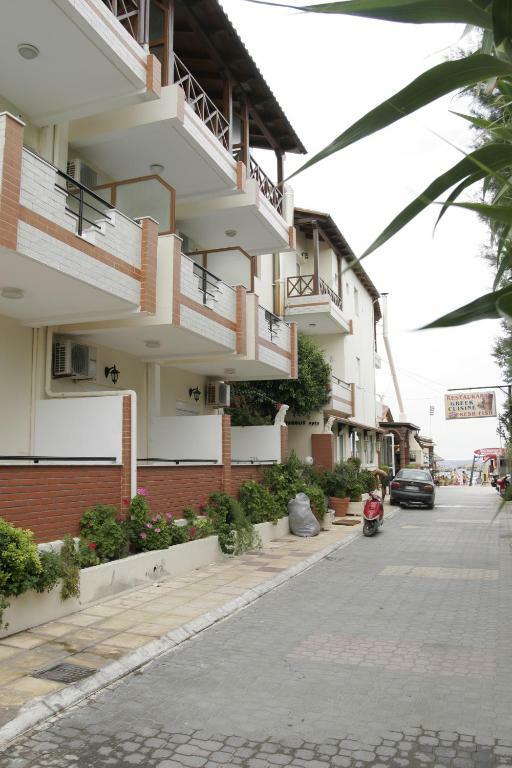 Lovely location, right on the seashore and also close to a bus station. The apartment was spacious and cleaned every two days. Maria is very nice and helpful. We loved every minute of our stay at Troulis apartments. 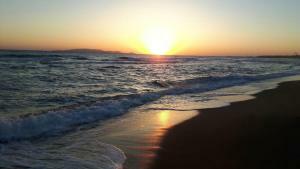 We wanted our first stop on our Cretan tour to be directly on the beach and we couldn't have been closer. Fantastic sea view, and 1 min from the golden sands of Golden Beach plus an excellent family run taverna with lovely Cretan cuisine. The best thing about the place though is the people... our hosts set the bar very high for Cretan hospitality. Special shout out to Aris and family. It was no surprise to discover holidaymakers returning year in year out, we will be back.